What remains of a business contact as an impression is usually the business card. That's why it should look as professional as possible. 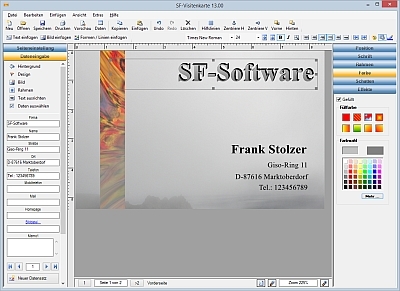 SF business card accepts your own contact information and then writes it on a business card whose layout can be changed by mouse click. Countless templates allow you to find the card that best suits your tastes. Professionals use the ability to customize the templates flexibly. It is possible to work with color gradients, shadow fonts, rotated texts and geometric figures. Images in formats such as BMP or JPG can also be embedded in the business cards. An own module even helps to create a very own background. SF business card prints out the finished cards - individually or in high quantity.